After experience in multimedia journalism, making a number of linear documentaries, and while studying for a Masters in Film McMillion decided to return to West Virginia to make a project looking at these issues. At first she thought she would make a linear documentary with an observational approach reflecting local perspectives. But once she got there she came across, “really phenomenal stories of pride and hope” and realised that she wasn’t “comfortable editing [those] into a 75 minute form and putting a title slide saying “The End””. She began to think about how she might make, “a project that wouldn’t just document, but maybe inspire people to get involved” and one that could reflect a developing story. Over time Hollow evolved into a “hybrid community participatory project and interactive documentary” in a form that seeks to work both for a wide audience – perhaps a one-off site visitor – and, in an ongoing way, with the local community. The Hollow Interactive Documentary just launched consists of a number of layers which have very different roles within the project. 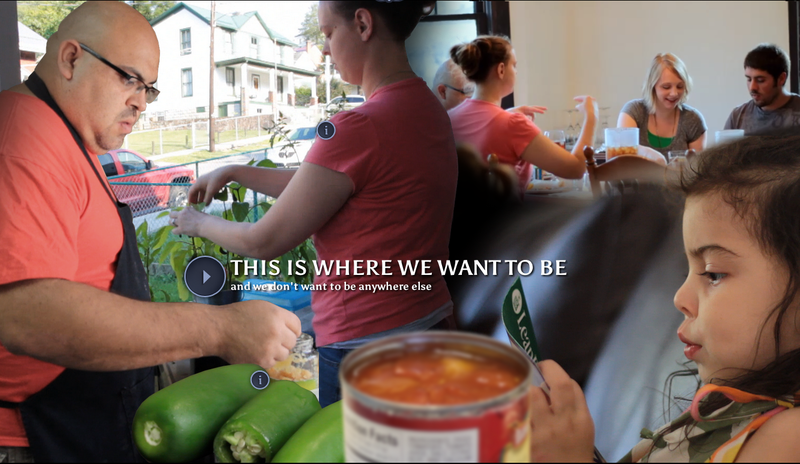 The story layer takes advantage of HTML5 to provide an immersive, fluid environment. 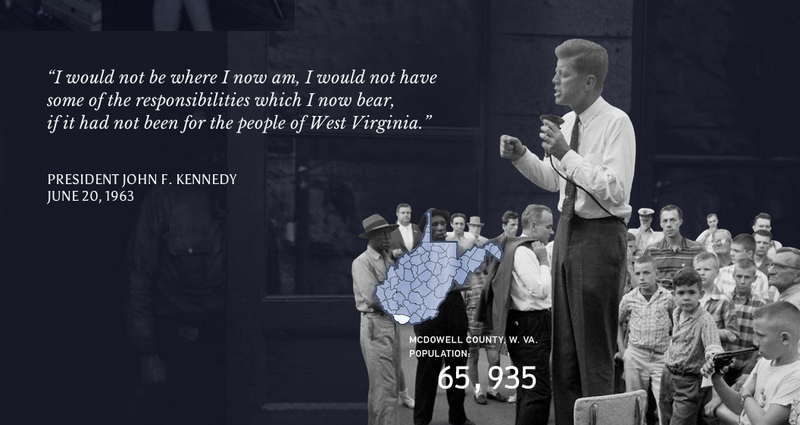 A rich timeline offers context – telling the story of 20th century McDowell County using photos, statistics and graphics which describe the arc from the boom times of fifty years ago (population 100,000) to today (22,000). 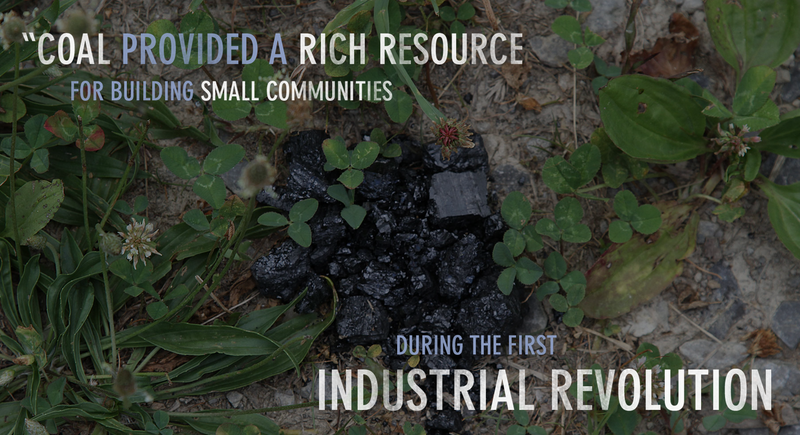 At the heart of the HTML5 site are thirty or so stories and portraits of McDowell people – a mix of participatory and producer-made content – arranged within five thematic sub-sections – such as When Coal was King – about the industry, These Roots – about place and culture, Around the Bend – initiatives towards an alternative future. Within these sections the user navigates using the scroll-down tool through a thematic environment which unfolds by a succession of wipes between stills, video clips, text quotes, data, soundtrack. The stories are encountered within this landscape so that the people featured emerge from a context of place and community. This radical approach to navigation arose from a desire, “to create a non-linear experience that wasn’t fragmented…What we’re really avoiding is database storytelling, where you simply sort the videos and you watch what you’re interested in. For example, if you’re interested in the economy, you watch those. Instead, we piece together environments in which people’s stories will be embedded, so it’s a constant flow of environments, story, voice and soundscapes. There’s never a point where the videos stop and you’re just looking at the screen not knowing what to do next. You’re always thrown into a new environment…”. There is some loss of control for the user in this navigational paradigm shift, but other things – inter-connection between stories, immersion – are gained. Another novel feature of the environment is the use of data for storytelling. As McMillion explained, McDowell County is in a negative sense rich in statistics – ranking high on various indices related to deprivation such as drug abuse and obesity rates. The use of these statistics has been part of a picture in which McDowell gets represented only as a symptom of social ills, a representation which constructs the community as a lost cause – collateral damage of post-industrialisation. McMillion has tried to reclaim the stats, “if you take that data and turn it on its head a little bit, put the qualitative with the quantitative, then maybe that will provide a richer storytelling experience and people will understand the challenges a little bit. The story is much more nuanced than much of the media likes you to believe. Statistics are black and white, and the stories add another multi-dimensional layer to that.” So an interviewee talking about the changing face of drug misuse in the community is backed up with a bar chart showing a sharp rise in prescription overdose deaths – which is drawn on the wall of an abandoned police station. There’s a dynamic with the user/ audience, too, and you are invited to contribute data at times – US users can enter their zip code to allow comparison between where they are from and McDowell County, for example. The participatory dimension of Hollow is most evident if you access the Update section of the site. From there you enter a WordPress website. A skeuomorph of a local paper, this section includes stories about developments in the area – “Half Pint Café Open”, “North Fork Fire Department Cleans Old Building” – a calendar of events, individual profiles. There is news about community members and an invitation to others to join. Designed to answer local communication needs, the platform is a tool for reflecting and building community initiatives. Comments in the “What the Community is Saying” section of the development website suggest that the project has already had a significant impact on some of those who have got involved, that it has provoked something important within individual and collective self-perception. 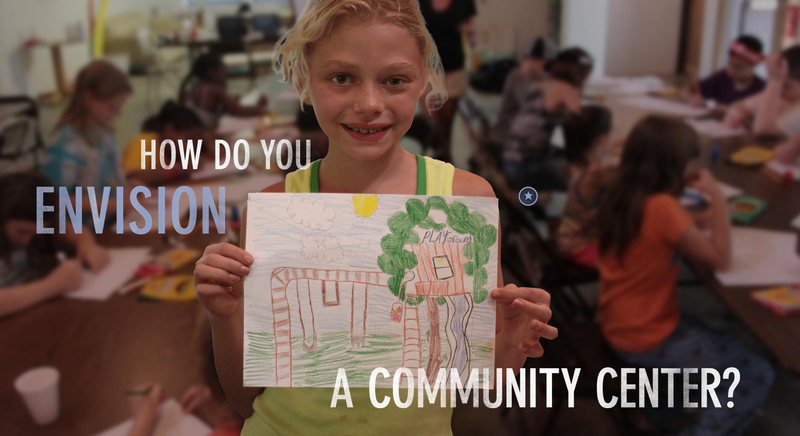 Comments include, “I feel like I have contributed to something important and it has changed the way I see the world.” and “I’m not sure I can explain the hope and sense of community that Hollow has inspired.” It’s clear that people feel an initiative like this would not have happened without someone like McMillion coming into the community. That brings home the ongoing nature of what Henry Jenkins calls the “participation gap” – the lack of engagement with participatory culture by those who feel they don’t have the skills to get involved. We are still a long way from universal participation and a project like this is a strategy to address that gap. Where Hollow draws on documentary and journalism, Question Bridge comes out of the art world. It has its roots in a 1996 installation by Chris Johnson and draws on his earlier public and collaborative work including “The Roof is on Fire” – one of the Oakland Projects (with Suzanne Lacey). The other artists behind the work – Hank Willis Thomas, Kamal Sinclair and Bayete Ross Smith bring experience of new media art, photojournalism and performance. The project is also informed by social science. As their Artist Statement explains, negative stereotypes have very real implications for black American men. Their dramatic over-representation in the prison system, for example, is associated with disenfranchisement and poverty but also with the psycho-social impact of American history and racism conceptualised over a century ago by the African American educator and sociologist W E B Dubois in the idea of “double-consciousness”. “The good news”, as the Artist Statement explains is,” that there are effective means of overcoming our negative bias about Black males. One of which, is being exposed to more complex, multi-faceted, and whole images and narratives of black males. This is what the Question Bridge project hopes to accomplish.” Participants are invited to offer a question that they would like to address to another black American man. Those questions – about racism, class, individual and collective responsibility and more – are filmed and then shown to a selected participant to answer. Over 1600 questions and answers have been gathered by the artists so far from 160 men. The dialogue between participants produced through editing then makes up the work. Those taking part come together as a virtual community to interrogate their situations and challenge an oppressive, monolithic construction of their shared identity. The filming strategy is designed to maximize the viewer’s involvement. Close-up talking heads pose and answer questions directly to camera so that you are positioned as the one being asked and being answered. Addressed as if a member of the community, you are called on as a peer to imagine and hear from many varied perspectives how the world looks through African-American men’s eyes. As an online experience, this has the intimacy of a one-to-one exchange. As an installation, this effect is created in another way too – the monitors are arranged so that you are situated as part of the group at eye level with the life-sized talking heads of the participants. In both cases, the effect works to make you feel that you are inside the dialogue, encouraging identification and disrupting a sense of otherness. Though a very different undertaking, Question Bridge has in common with Hollow that it’s designed to work on two levels. It’s about a community – reflecting lived experience and complexity – and challenging preconceptions. It’s also for the community – a platform through which the participants focus on and ask viewers to think about their common concerns. As well as its presence online, the project has played out as an installation in galleries and museums across the US and beyond, and has been the catalyst for community dialogues and education initiatives which have reached over 100,000 people. 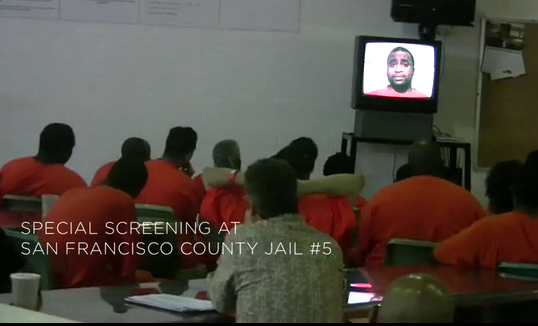 The Kickstarter video provides a good introduction to the project and reflects the impressive scale and engagement of the work to date – from events with school kids to a screening with San Francisco jail inmates to a panel at the Brooklyn Museum. Now the artists behind Question Bridge want to take their “video mediated megalogue” to the next stage, creating an interactive and mobile version of the project that will allow the user to explore and find out more, using, “smart technology to stimulate human interaction…using online to connect people face-to-face”. The ambition now is to “impact millions”. To fully grasp and evaluate these projects we will need to move beyond commentaries by their producers to understand them from the perspectives of participants and involved communities. We need to think about access and inclusion, finding out who gets involved and why. We need to think about mediation and consider the tension between facilitation and constraint within a call-to-action. McMillion has a background in research on questions of media in community change. Partners will be involved in assessing Hollow and I look forward to their findings. The Question Bridge team are tracking their process, and gathering data from the workshops and museum events. It’s good to see that the Tribeca New Media Fund who supported both Question Bridge and Hollow are developing research with MIT OpenDoc Lab on the under-explored links between participatory media production and social change – a programme of work outlined on the TFI Sandbox. Impact and engagement are also themes within a research network proposal that we’ve been developing at the DCRC ( home of i-Docs and CollabDocs). There’s a great deal of interest among producers in using media for social change. We now need shareable research and insight from projects engaging in this kind of work. Hollow is still at an early stage, “the project doesn’t even really begin until launch, because that is when we actually can see if these new media tools and community participatory frameworks – if they can actually be used to create meaningful change and awareness.” And a significant part of the Hollow offering – a partnership with the Sunlight Foundation to provide transparency about government spending in the locality – isn’t yet fully in place. Question Bridge is further down the line and the team are now focused on building on the momentum they’ve generated. Executive Producer Jesse Williams was inspired to get involved after getting interested in Question Bridge as an art work and then and realising its transformative political potential, “Question Bridge: Black Males started out as an art project and is quickly becoming a movement.” Question Bridge is a highly focused intervention within the realm of portrayal, image, self-image. Can it be a catalyst for change in the lives of black American men? 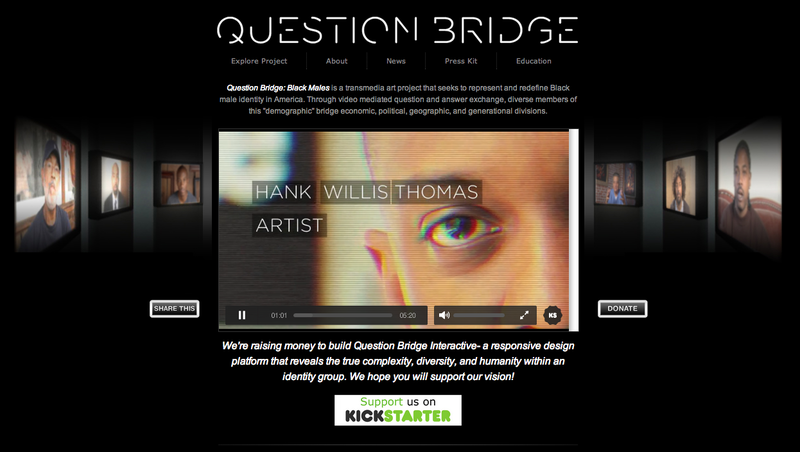 “Can a question change the world?” Hank Willis Thomas asks at the end of the Kickstarter fundraising video. Let’s support the Question Bridge campaign and find out.